Createspace Independent Publishing Platform, 9781499698886, 184pp. It's easy to see others living our dreams. It's easy to feel held back, misunderstood and invisible, but there comes a time in our lives when we just can't take it anymore. This is when we need answers and the confirmation that who we think we are can change. The pain of jealousy and envy grew too much for Kelly Martin when she saw friends, family and strangers passing her by in every single area of her life. Feeling crushed by the weight of the 'comparison junkie' she cried out for answers. How could she feel good enough when she felt knee-deep in poverty and loneliness and when she carried a bag called 'I feel like a failure' on her back? 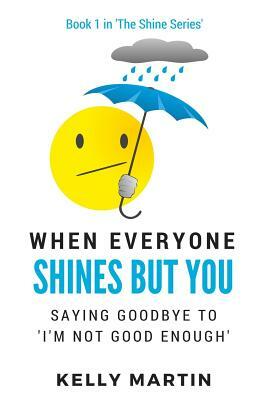 'When Everyone Shines But You' (Book 1 in 'The Shine Series') was born out of a desperate desire for relief from the pain of depression and anxiety. Kelly sat down one day and asked her heart for answers that her mind was unable to bring. She longed for wisdom and knowledge, and it came. 'When Everyone Shines But You' takes the reader through everyday life challenges in a way that shows how to handle life's stresses in a kinder and more intuitive way. It's not a fast-food approach to personal or spiritual growth, because it takes commitment to take this path, but sometimes life encourages us into the depths of our life's journey. If you want change, it has to begin from within. Discover why positive thinking does not work. Explore your relationship with feelings such as rage, envy and sadness. See how mindful living can consistently bring relief. Recognise the gift in using frustration as a motivation to step forward. Give up the 'fast food' approach to personal growth and grow more naturally. Learn how to experience alone time as sacred instead of painful. Understand how trying to control your world has been re-enforcing your story. Kelly Martin began her writing journey in 2007 when she started questioning her reality via her blog 'Kelly Martin Speaks'. A passionate writer and sharer of information, she had this burning desire to know who she was beyond the suffering of the previous 30 years. From an early age she was very shy and experienced anxiety that prevented her doing many things young people got to do and this continued into her adult life. She avoided social group settings and nearly missed graduating from University because she was unable to give presentations due to intense fear. So she has made it her life's work to make peace with who she is and to encourage others through a process of embracing being human. She always felt that the pain and fear of her human story held a message, and through beginning a process of mindful living, she began to understand that all her perceived flaws were actually gifts and needed tenderness not constant criticism. She now writes on ThankTheNow.com, and her own blog KellyMartinSpeaks.co.uk and KellyMartin.co.uk. Kelly currently lives in Gloucester in the UK with her best friend Mike and enjoys walks in nature, visiting new places and playing with her visiting cat.